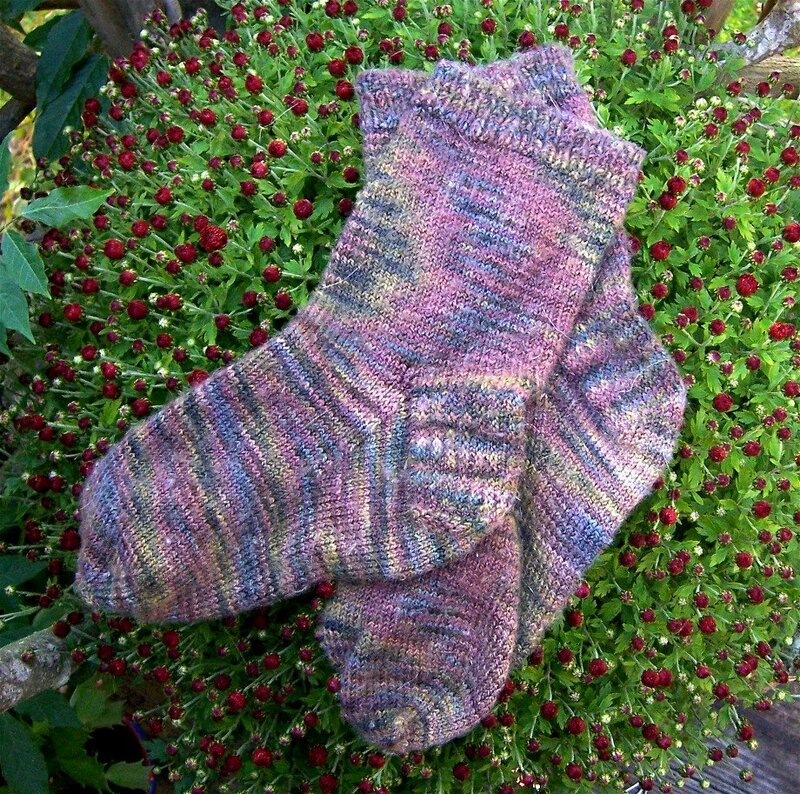 Lolly’s Soctoberfest Sock History Questions! When did you start making socks? Did you teach yourself or were you taught by a friend or relative, or in a class? I taught myself to knit socks in December of 2002, using Clara’s excellent tutorial at Knitter’s Review and books (I don’t remember which ones, but I do remember that the Twisted Sisters book both helped and annoyed me). I kept returning to the tutorial, and remained with it through the first few pairs. I also learned a great deal from reading and asking questions on Knitter’s Review Forums. I would have ordered good needles when I ordered the yarn. I had Bates aluminum DPN’s, and I hated them. Other than that, I don’t think I’d change anything about that first experience. Hand-painted yarns in superwash Merino take up most of the space in my sock yarn stash. I like Sundara’s yarn a lot (1.5 pairs). I like Socks That Rock (4.5 pairs), Cherry Tree Hill (4 pairs), and Lorna’s Laces (5.5 pairs). I like Fleece Artist (1.5 pairs so far) and Koigu (2 pairs). I guess I have to face it – I like ‘em all. I purchase most of my sock yarn online, but whenever I’m in a yarn store (or at Rhinebeck!) my Sock Yarn Radar is set on high. My stash also contains Claudia Hand Paints, Nature’s Palette from Hand Jive, ArtYarns Ultramerino, Trekking XXL, miscellaneous self-patterning yarns, and enough Elann solid sock yarn to last three lifetimes (you know, just in case). Do you like to crochet your socks, or knit them on DPNs, 2 circulars, or using the Magic Loop method? I knit my socks with five DPN’s. I know how to use two circulars and the Magic Loop (a definite must for sweater sleeves and hats), but I love my double pointed needles. I love the sweet little square that collapses into a tidy little bundle (which I keep safe with all those Stitch Keepers!). My favorite needles are my many sets of Brittany Birch and Crystal Palace bamboo. The sizes I use most are 2.25 and 2.5 mm. I rarely go up to 2.75 or 3.0 mm. I usually use a larger needle for the top of my socks and a smaller one for the foot. Or not. I like to knit my socks top-down with a heel flap. Flap heels fit my foot better. I know how to do short-row heels, and I know how to knit toe-up, but I just like what I like. I’m on a round toe kick right now—it’s so pretty and, well, round! About twenty. Fourteen pairs are in my sock drawer, and the rest are keeping other feet warm. I have five pairs in various stages of completion (hmm…I’m at least part-way into the second sock on all of them) and I’m having a hard time resisting the call of at least two skeins of yarn right this minute. I’ve worn them already, and they are very soft and comfortable. My sock knitting technique and execution have improved a bit, I think. 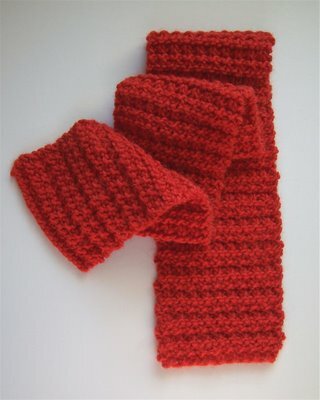 Here’s my first scarf for the Red Scarf Project. I’ve already started another one in Patons Shetland Chunky Tweed (in Deep Red, of course). P.S. : I almost forgot to tell you about Jane’s Second Annual Show Me Your Socks Contest! The deadline is tonight, though. If you have time to photograph your socks, go ahead and enter. It’s fun, and there are prizes! 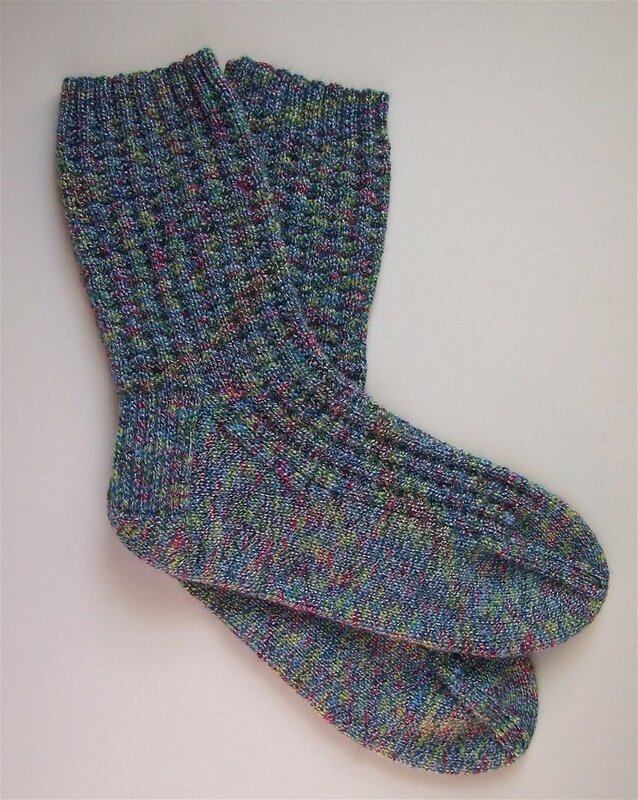 Regia Bamboo socks look wonderful. I am looking forward to try it, LYS does has it on order. red is a fun color to work with. your scarf is a great red. I am 1/2 way through one, and I am pretty sure I’ll make at least one more before Jan. I really like the looks of the Regia Bamboo socks. I’m going to have to try that yarn one of these days. Hmm, those bamboo socks look like they might be waffles? K2P2 for 2 rounds, then knit for 2 rounds? Lovely!